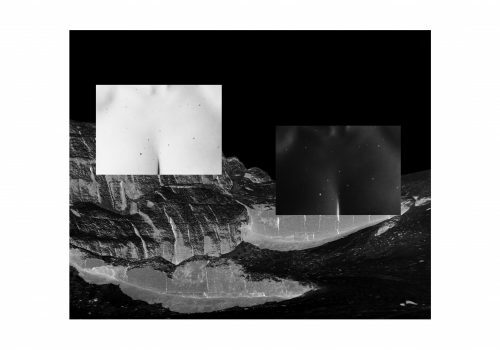 Paolo Bini’s artistic research is an investigatory attempt to transform and re-appropriate the authentic notions of ‘the memory of an image’ as it adheres to the contemporary rhythms in the world around us. These images are formed as a pixilation of units. Usually marked out by a scanner or a plotter, the result is a succession of colored stripes that become a succinct and redefined translation of what came before. 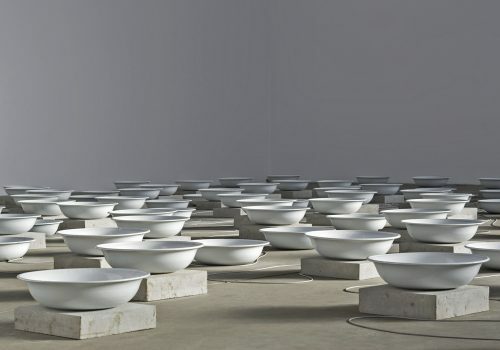 Paolo Bini has exhibited work at Galleria Alberto Peola, Turin; Museo MADRE, Naples; and Reggia di Caserta, all Italy, among others. 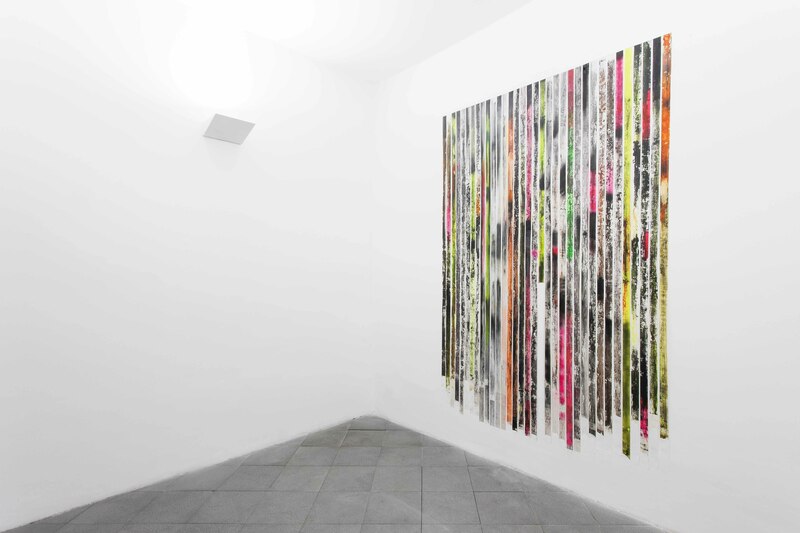 Paolo Bini, diNUOVOpaesaggio, 2014, acrylic on paper tape on Fabriano paper on wall, 13313/16 × 865/8 in. (339.85 × 219.96 cm). Paolo Bini, Volume Introspettivo, 2015, acrylic on paper tape on canvas, 59 × 59 in. (149.86 × 149.86 cm). 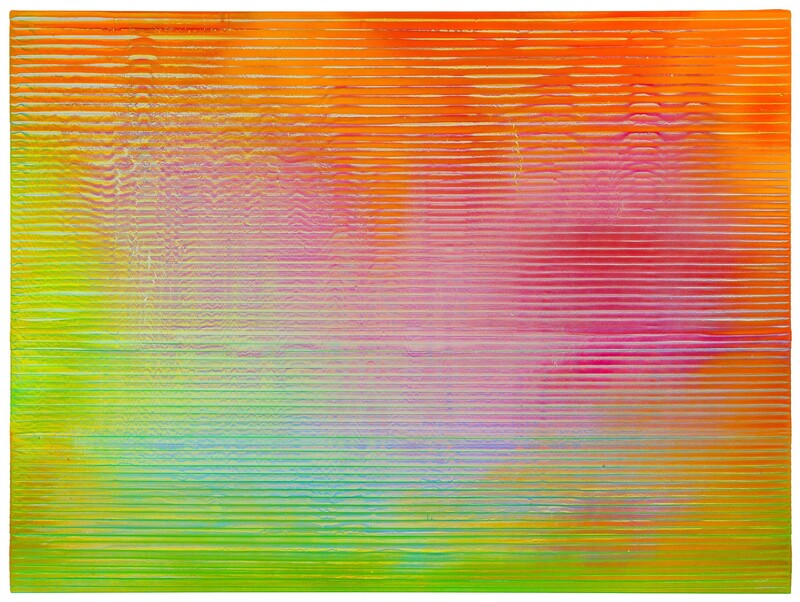 Paolo Bini, Luoghi del Sè, 2016, acrylic on paper tape on canvas, 59 × 78 in. (149.86 × 198.12 cm). Paolo Bini, Paradise Box, 2016, acrylic on paper tape on canvas framed on wood, 791/2 × 22611/16 in. (201.93 × 575.82 cm). Paolo Bini, Mediterraneo Rosso Oro, 2018, acrylic on paper, dimensions variable. 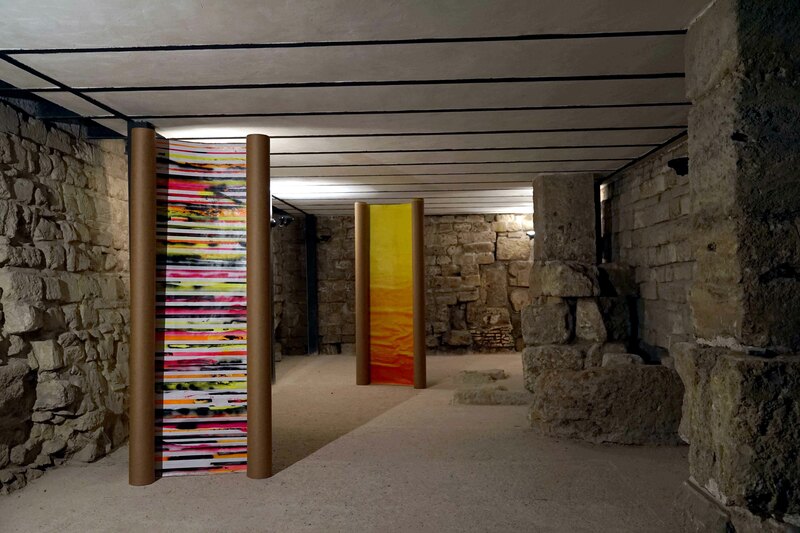 Installation view at Cappella dell'Incoronata, Palermo. Jude Griebel’s work presents sculptures of hybrid bodies, whose anatomy is merged with their surroundings. These figures are compromised by situations of consumption, excess and disregard, played out on their dioramic surfaces. 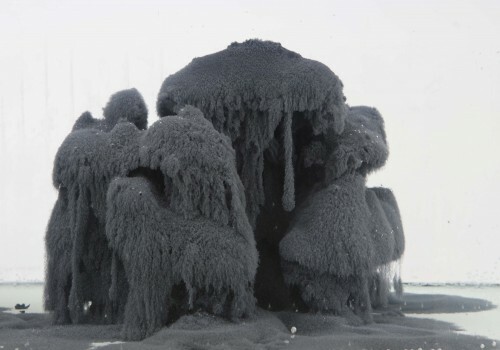 In these works, he is not so much interested in how waste is generated, but rather how we re-digest popular images of accumulation and environmental degradation, weaving them into the fabric of our subconscious. 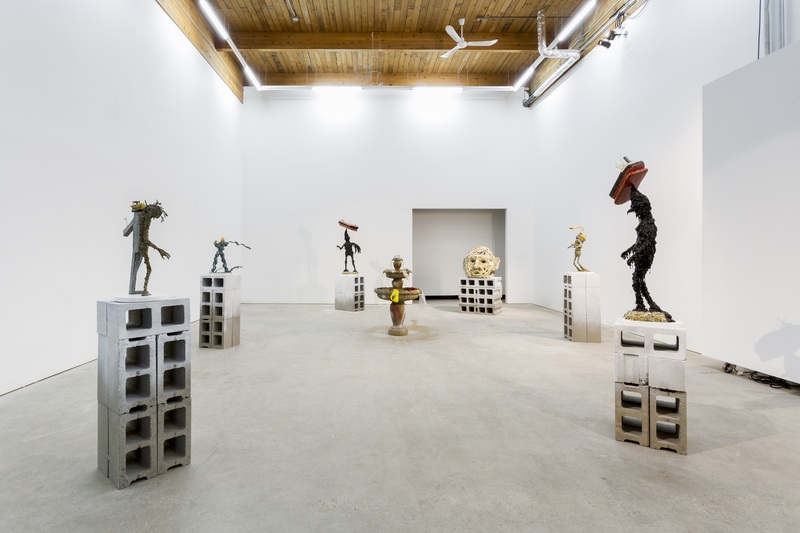 The sculptures embody these internalized and conflicted narratives of want and ruin, reifying them in monstrous and mythological proportions. 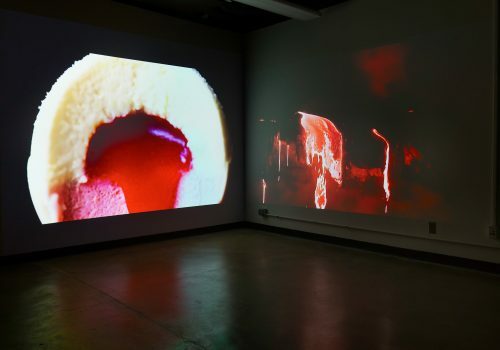 Though informed by broader cultural desires and anxieties, the works resonate at a more personal level through the use of playful humor and autobiographical reference. Jude Griebel received an MFA in sculpture and ceramics from Concordia University in 2014 and has worked in residence in institutions including Halle 14 Center for Contemporary Art, Leipzig, and MASS MoCA, North Adams. 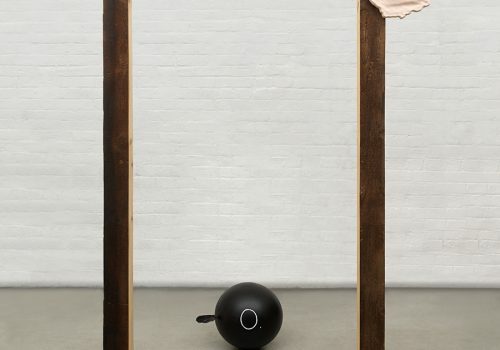 He has recently exhibited at the Spinnerei Archiv Massiv, Leipzig; Esker Foundation; Calgary; dc3 Art Projects, Edmonton; Galerie Sturm, Nuremberg; The Redpath Museum, Montreal; and presented a major sculptural installation in Future Station: The 2015 Alberta Biennial of Contemporary Art at the Art Gallery of Alberta. 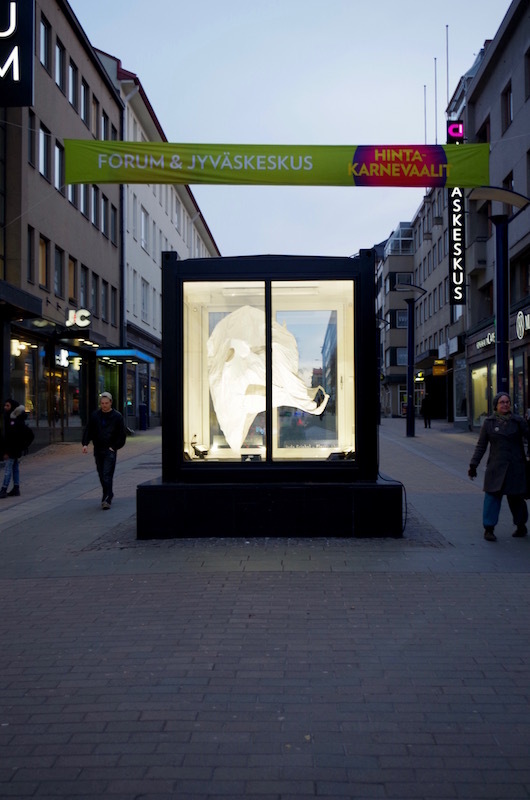 In April 2017, his public sculpture Plastic Ghost was mounted in the city center of Jyväskylä, Finland. Griebel has recently been awarded grants by the Canada Council for the Arts, the Alberta Foundation for the Arts and he is a three-time recipient of the Elizabeth Greenshields Foundation grant for international emerging artists. 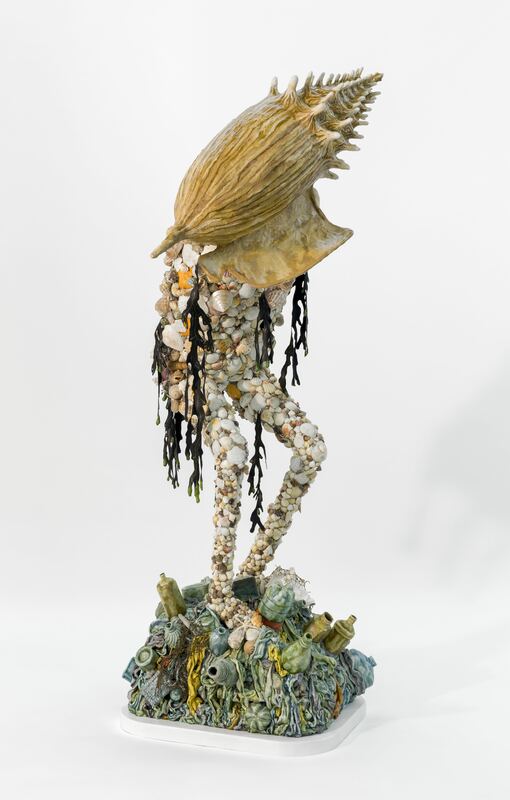 Jude Griebel, Off-Shore, 2017, wood, rein, shells, and oil paint, 751/2 × 22 × 271/2 in. (191.77 × 55.88 × 69.85 cm). Photo courtesy of dc3 Art Projects, Canada. Jude Griebel, Crafting Ruin, 2017, installation at dc3 Art Projects, dimensions variable. Jude Griebel, Plastic Ghost, 2017, public sculpture in Jyväskylä, Finland, 9 × 9 × 12 in. (22.86 × 22.86 × 30.48 cm). Photo courtesy of the artist. Danilo Correale’s work analyzes various aspects of human life such as labor, leisure and sleep through the lenses of time and the body. His recent works focus on speculation about post-labor society, nonaligned subjectivities, idleness and withdrawal. Danilo Correale (born Naples, 1982) currently lives in New York City. He is the founder of the Decelerationist Reader and a regular contributor to publications in the field of critical theory. His most recent publications include The Game – A three sided football match, FeC, Fabriano, 2014 and No More Sleep No More, Archive Books, Berlin, 2015. 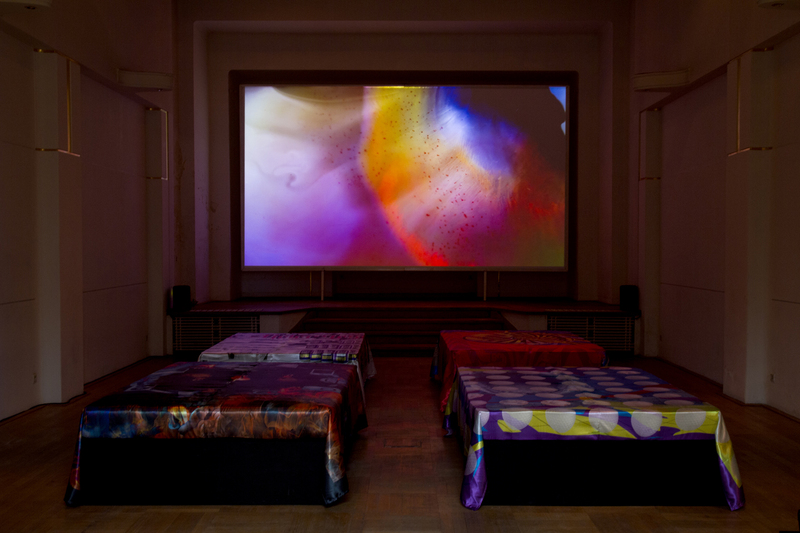 Correale’s work has been presented in numerous group exhibitions including the 16th Art Quadriennal, Palazzo delle Esposizioni, Rome, 2016; Pigs, Artium Museum, Vitoria-Gasteiz, Spain, 2016; Ennesima, La Trienniale de Milano, 2016; Kiev Biennial, 2015; The Museum for Modern and Contemporary Art of Bolzano (Museion), 2015; Museum of contemporary Art Donna Regina, Naples, 2014; Steirischer Herbst Festival, Graz, 2013; Fondazione Sandretto Re Rebaudengo, Turin, 2012; Manifesta 8, Murcia, Spain, 2010; Moscow Biennial, 2010; and Istanbul Biennial, 2009. 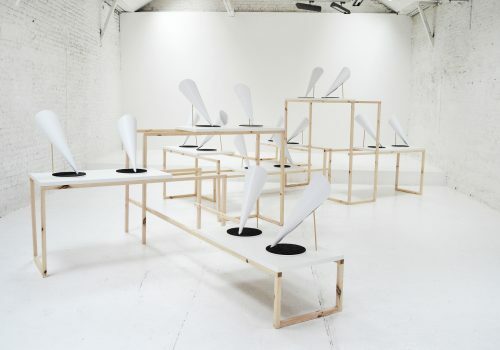 Recent solo shows include Tales of Exhaustion, La Loge, Brussels, 2016; The Missing Hour: Rhythms and Algorithms, Raucci/Santamaria, Naples, 2015; The Warp and the Weft, Peep-Hole, Milan, 2012; Pareto Optimality, Supportico Lopez, Berlin, 2011; and We Are Making History, Entrèe, Bergen, Norway, 2011. 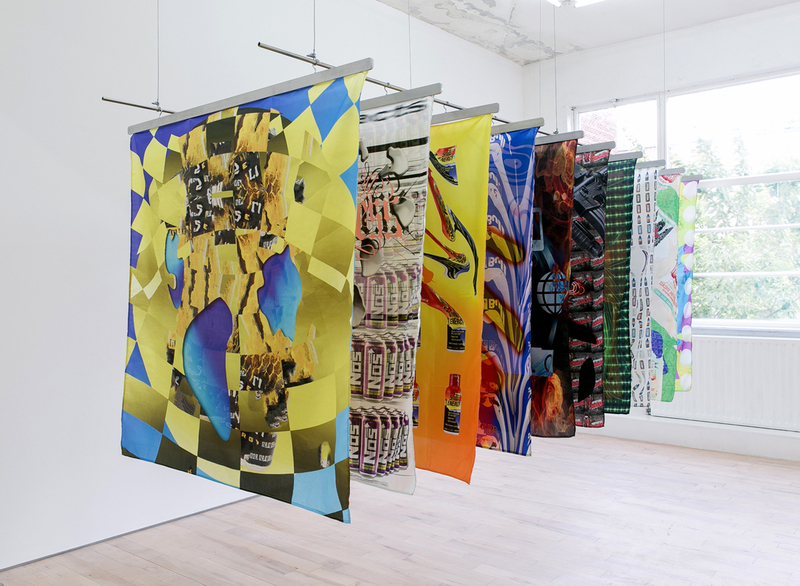 Danilo Correale, Boosted, 2014-2015, Digital print on silk and aluminium frames, 100 × 100 × 250 in. (254 × 254 × 635 cm). 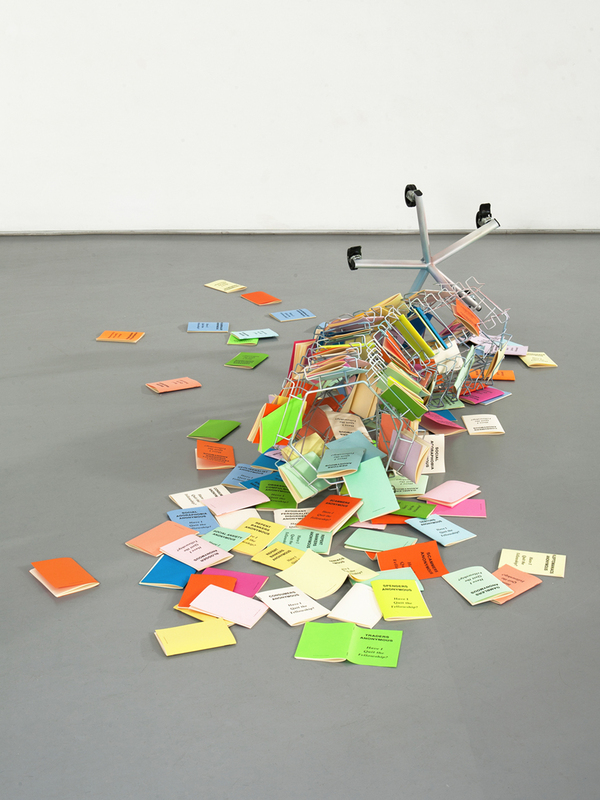 Danilo Correale, Tales OF Exhaustion, 2016, Mixed media. Image courtesy of La Loge and the artist. 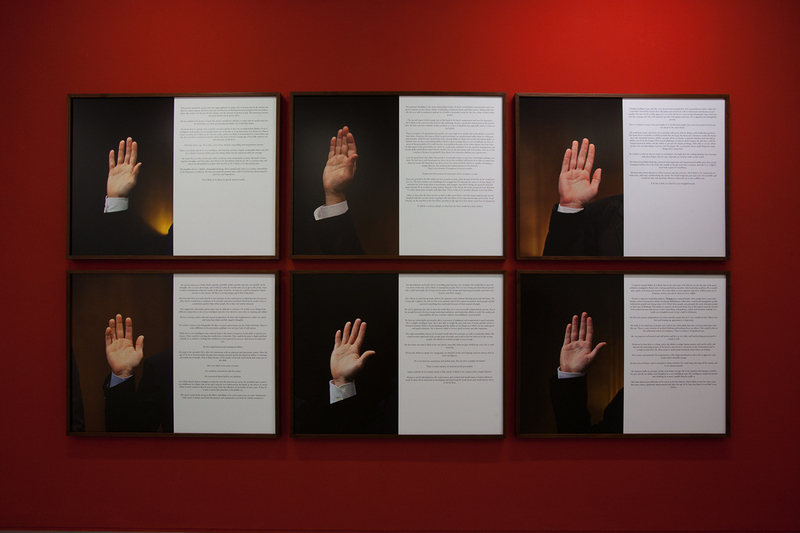 Danilo Correale, The Future in Their Hands (the visible hand), 2011-2012, 50.5 x 40 in. each. 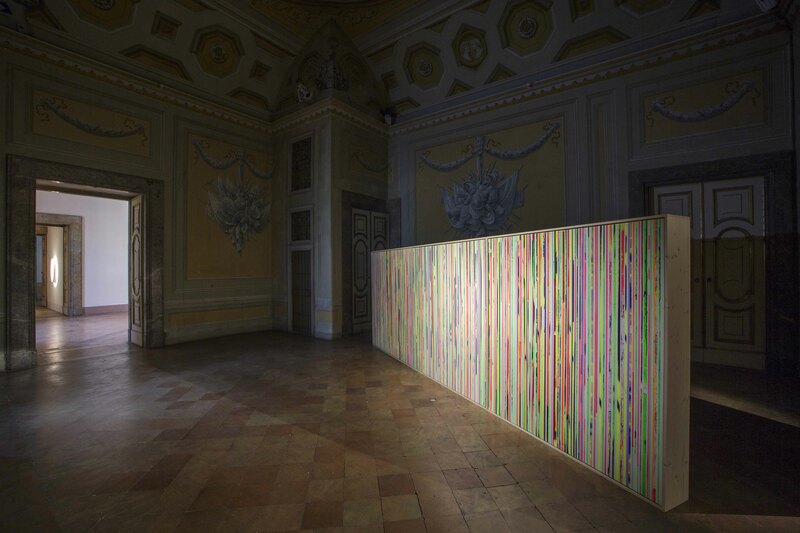 Danilo Correale, The 13th Step, 2012, Postcards display, iridescent paint and 150 publications, Dimensions variable.